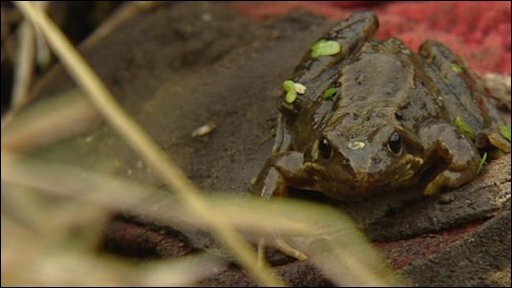 What is claimed to be Britain's first "frog hotel" is to be created on the banks of the Water of Leith. The two-tier structure, made from wood and recycled materials, will be placed alongside a pond in Redhall Walled Garden in Edinburgh. It is designed to protect mating frogs, which are vulnerable to predators such as foxes and herons. The project aims to encourage breeding amphibians and highlight the work volunteers do for the environment. Robert Henderson, Scottish co-ordinator for the CSV Action Earth campaign, said the hotel would be a beehive structure. "At ground level is what's called the Compost Cafe", he said. "Then there's a ramp up to a more protected area where frogs can hibernate in the winter."